As much as we hate to make this update, we've got some sad news incoming. We've just learned that Episode 13 & 14 will be the last two episodes for the Fifth Stage, which will air on May 10th, 2013. From the Official Website: 「いよいよクライマックス、Fifth Stage最終回！拓海の神奈川ラストバトルは！？そしてプロジェクトDの真の目的とは！？」When translated, it reads: "Finally, we reach the climax of Fifth Stage's final episodes! Takumi's last battle in Kanagawa?! And will the true purpose of the Project D be revealed?!" So this is it, folks. The question that's been on every Initial D fans' mind in the past couple months. Fifth Stage will have 14 episodes total. Nothing more. What does this mean and where do we go from here? From the description of ACT.13 & 14, it seems the anime finally catches up to the manga. 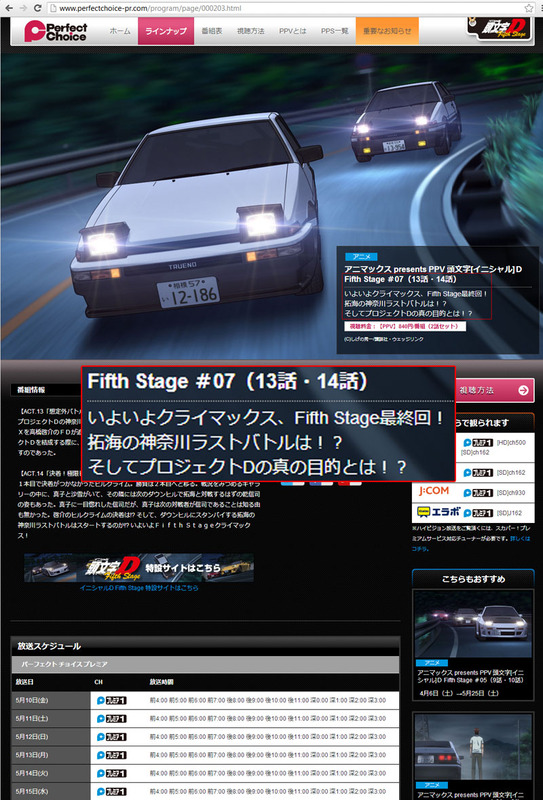 Many of us on the forums were already suspecting that if they do make 15 & 16, it'll sort of go beyond the progress of the current manga storyline, making it noncanonical, which is very unlikely for a legendary series like Initial D.
The author Shigeno did announced that the manga is near the end, that means even if there are a bit more storyline after Fifth Stage, it'll only be enough for a movie/OVA. It seems very likely now that we know Fifth Stage only has 14 episodes. Image size reduced, original size: 800 x 1178. Click here to view the image in its original dimension. ...I don't know how to feel about that. i honestly think fifth stage was crap compared to the original ID. i felt like it got more obvious and and very unrealistic. i would honestly let fifth stage die. Still hoping takumi doesn't lose tho. The 'obvious and unrealistic', if you're talking about what I think you're talking about, isn't the fault of Fifth Stage--it's the original manga plot. Fifth Stage had plenty of problems...but elements of the story being 'unrealistic' weren't its fault. Unrealistic? That started back in First Stage when the 86 defeated cars it never stood a chance against. They can be made into absolute track MONSTERS. That's a bike motor under the hood, capable of revving to 12k+. Throw like a T28 on there and you'll be set. Toyota Sports 800 with a turbo Hayabusa. I've seen one doing autocross. I want one like you wouldn't believe. I don't know N1... I've been here long enough to believe anything now.